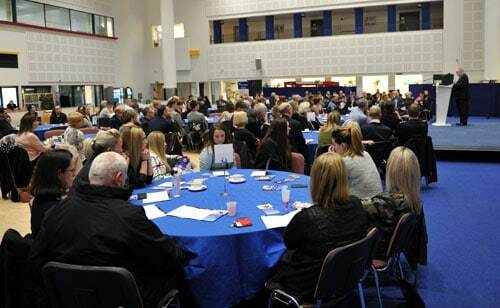 The 10th annual Kirkcaldy and Central Fife Sports Council awards were held at Fife College in Kirkcaldy on Thursday 8th March 2018. In front of yet another record turnout the ceremony honoured the top achievers in sport from the Central Fife area throughout the year 2017. Yet again a wide variety of sports was covered during the evening. There were a total of 14 awards on offer this year – this included 2 brand new awards aimed at Schools. There was also the Sports Personality of the Decade. The Fife Free Press Sports Personality of the Year, which is voted for by the readers of the Fife Free Press, Glenrothes Gazette and East Fife Mail. This years event was organised and hosted by Sports Council committee member George MacDonald. The guest speaker was CEO of Fife Cultural Trust, Heather Stewart. No Replies to "10th Annual Awards Ceremony"